Shady Grove Fertility joined hundreds of infertility advocates on Capitol Hill for Advocacy Day 2016 to affect change for the one in eight couples who struggle with infertility. Advocates asked for specific support from member of Congress on four pieces of existing and pending legislation that have prevented couples, including injured veterans, from accessing the care they need. On Advocacy Day, patients, volunteers, and professionals have the opportunity to educate legislators from all 50 states that infertility is in fact a disease. More than 20 physicians, staff, and current and past patients of Shady Grove Fertility raised a voice for infertility on Capitol Hill last week and participated in RESOLVE: The National Infertility Association’s Advocacy Day. Over 220 patients, healthcare professionals, and Veterans, in total, met with their Members of Congress to discuss the impact infertility has on couples. 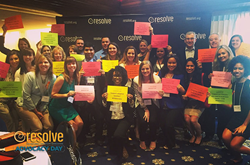 Shady Grove Fertility, the largest fertility center in the U.S., joined infertility advocates for RESOLVE: The National Infertility Association for Advocacy Day on May 11th in Washington, D.C. The collective mission raised awareness among Members of Congress about the scope of infertility in this country and the need for increased insurance coverage and benefits for family building resources. Shady Grove Fertility’s Drs. Gilbert Mottla, Eric A. Widra, and Shruti Malik, as well as CEO Mark Segal and many others met with various members of Congress to discuss how infertility patients could benefit from greater access to fertility care. Shady Grove Fertility advocates also spoke on behalf of the constituents who could not join Advocacy Day in person, but wrote letters to their Senators and House Representatives. “Infertility is often misunderstood, or at best, poorly understood by those who have not experienced it. On Advocacy Day, patients, volunteers, and professionals have the opportunity to educate legislators from all 50 states that infertility is in fact a disease affecting both women and men. The trained advocates educate legislators and their staffs about infertility legislation before Congress, provide additional and personal insight, and ask for support to pass various bills,” said Gilbert L. Mottla, M.D., of Shady Grove Fertility’s Annapolis, MD, office. Shady Grove Fertility patients, injured war veteran Kevin Jaye and his wife Lauren, who went through two rounds of infertility treatment and are expecting their first child in a couple of months, were honored at the event by receiving the Hero Award from Resolve. The distinguished award recognizes the special efforts of people in the infertility community. The Jayes have been integral in raising awareness about the lack of coverage for injured veterans and are actively seeking to change the existing law in Congress that restricts the Department of Veteran Affairs from covering infertility treatment cost. Women Veterans and Families Health Services Act that allows veterans to obtain IVF, adoption assistance, and other family-building benefits. The Veterans Amendment to the Senate Appropriations Mil-Con Bill, which will provide funding for the VA to offer IVF to veterans for 2 years. The Adoption Tax Credit Refundability Act, which restores refundability so that families who need the credit the most will receive it. And lastly, the CDC’s Goals of the National Action Plan on Infertility. Shady Grove Fertility is a leading fertility and IVF center of excellence, offering patients individualized care, innovative financial options, and pregnancy rates among the highest of all national centers. 2016 commemorates 25 years of Shady Grove Fertility providing medical and service excellence to patients from all 50 states and 35 countries around the world, and celebrates over 40,000 babies born—more than any other center in the nation. Today, 34 reproductive endocrinologists, supported by a highly specialized team of 600 urologists, Ph.D. scientists, geneticists, and staff care for patients in 18 full-service offices and five satellite sites throughout Maryland, Pennsylvania, Virginia, and Washington, D.C. Shady Grove Fertility physicians actively train residents and reproductive endocrinology fellows and invest in continuous clinical research and education to advance the field of reproductive medicine through numerous academic appointments and partnerships such as Georgetown Medical School, Walter Reed National Military Medical Center, the University of Maryland, and the National Institutes of Health. More than 1,700 physicians refer their patients to Shady Grove Fertility each year. For more information, call 1-888-761-1967 or visit ShadyGroveFertility.com.